This week I caught up with a returner for the volleyball team, Jaelyn Olsen, to get her thoughts and feelings on the upcoming season from questions about spring ball, the upcoming season and even some personal questions. Q: First off, how has spring volleyball been going for you and the team? A: Spring volleyball has been a little bit trying because we’ve lost a few girls, but it has been really fun and a great learning experience. We played a tournament at Westminster [College] this past Saturday and got a good look at the team for next year by playing all of the freshman. We definitely came together as a team and got some good things done. We finally beat Snow [College] for the first time in two seasons! Q: Ultimately, why did you decided to come back for your sophomore season? A: I decided to come back and play here because I love Coach [Danielle] Jensen and the way she runs the program. I get along with all of the girls too so it just made sense to stay. Q: What are your dreams and aspirations for the game of volleyball? A: I just want to keep playing for as long as I can because I love this sport so much! I will transfer and play at a D2 or D1 for my junior and senior year. Q: What are your expectations for the fall 2017 season? A: I am so excited for our upcoming season. We have about eight new freshmen coming in and they are going to make a huge difference for our team. It’s going to be our year next year and I can’t wait to show the conference what we can do. Q: What are your plans for the summer to improve? A: During the summer, I’m going to train on the sand. The sand works and improves everything when it comes to volleyball. It increases your vertical and quickness. So, being a middle, that will be very good for me. Q: What expectations do you have for next year’s team as a returner? A: I expect the rest of the team to work hard over the summer and come ready to play. We need to have the winning mindset going into the preseason and that will carry onto the regular season. Q: This one is a little bit different from the rest, but what would you describe as a perfect Friday night for Jaelyn Olsen? A: Haha hmm, I think a perfect Friday night for me would start off by eating some amazing food, and then going out and having a bonfire or doing something fun with my friends and family. 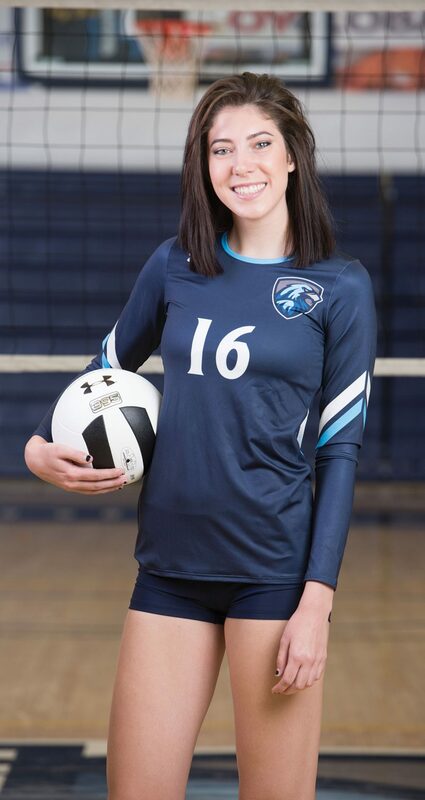 Olsen is a great leader, student, athlete and about as competitive as they come and has high dreams and aspirations for the 2017 Utah State University Eastern volleyball team. This last year Olsen averaged for the Eagles: K/S1.33 H %.160 A/S0.02 B/S1.04 SA/S0.02 D/S0.34. You can follow Olsen and the Eagles on Facebook and Twitter at USUEasternAthletics or at www.usueasternathletics.com for live updates over the summer on the status of the volleyball team.